Summer 1997 – four women left separately on a journey to the unknown that we thought would end in Birmingham. We had much to learn – that journey continues to this day. The 4 of us had learned, in different ways, about a 3-day training/learning event that was the culmination of what had taken place the previous 18 months in 5 distinctly different locations in the US. The idea of Christian Women’s Job Corps had found its birth in the hearts of women of the Woman’s Missionary Union – headquartered in B’ham. These women had observed how women were helping other women in the Appalachian region of the US – basically one woman at a time mentoring another. They observed that real difference could happen when one woman truly invested herself in helping another woman obtain a better life situation. From those observations God led these women to “try out” that idea – which they did in these 5 locations. The 4 of us who took that first step were inspired that the same idea would work and was needed in Huntsville. We knew it was needed!! We came back with the dream of beginning our first classes almost immediately. That didn’t happen. The more we progressed, the slower we felt we were going. However, God’s plan was at work and visible by the varied people He continued to bring to the planning table. We immediately knew that we wanted CWJC of Madison Co to be a church and community model – never belonging to a single church or denomination, but rather should be inclusive of all Christian church bodies. God also began to bring to the table people of the community – people from education, government, businesses – all of whom wanted a personal way to invest in our county. We could see a school in the making. We finally felt confident enough to offer our first classes the fall of 1998. We had found a place to meet; we had located a workable curriculum that was flexible and user friendly; we had volunteers - to teach, serve a day each week as the site coordinator (a term that came along much later), bring lunch, furnish supplies, and most important – a mentor for each of our students. This short paragraph in no way tells of the work behind bringing all those pieces together to offer this class. Finding our first students who were willing to take a risk with an unknown educational plan was bigger than we’d imagined. We had expectations of our students as they had of us. But God provided at every turn – for each of the above boxes to be checked. The overwhelming beauty was that we knew then that we would offer these classes at no financial cost to our students. That will always be the way CWJC operates. CWJC truly began and is today – a model of churches and community working as one. God led people to provide the money we needed to have the materials our ladies would need. Even our first computers were free – from the NASA facilities computer “graveyard”. I could write a book with all the ways God provided all we needed. But He did – over and over til this day. 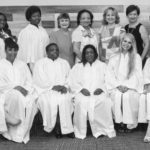 Now Christian Women’s Job Corps of Madison County has 4 sites – each distinctively different to meet the needs of women who need CWJC. We have 5 staff members – 1 full time and 5 part time – all who are true ministers at heart – under paid, overworked and over qualified. But, God brought their hearts of ministry to CWJC. Early on we tried to decide how to measure “success”, realizing that’s hard to do in a ministry since we don’t know the hearts of all. But one measure we felt we could bank on was when one of our graduates returned as a mentor. That happened! And – it now happens on a regular basis. In fact, we’ve had graduates return as teachers. This ministry works! These stories will give you a glimpse of that fact. The stories are different. One woman’s “success” is different from another’s; her situation is different. As you read the stories, however, you’ll see that our students begin to look at their “differences” in a new light as they share their uncommon and common life situations. It’s a beautiful thing to see. CWJC continues to be and become what a woman needs to make life better for herself and her family. Our “under the table” motto has become – We’re nothing if not flexible. Our population of students has changed dramatically with these 20 years as we’ve been sensitive to the changes in life. Our ladies are varied from age, life experiences, family situations, educational background, nationalities, needs. Yet CWJC works for all because God remains the focus of who we are. To God be the glory! Great things He has done.